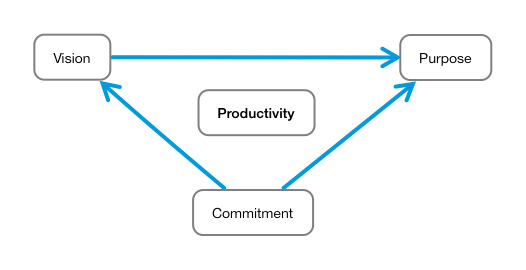 When you break productivity down, it only has three parts to it. If you find yourself not being productive when you want to be, it’s due to a problem in at least one of these three areas. 45-ways-to-be-more-productive articles are the how. Time boxing, eating the frog, closing open loops, MIT’s are the how. Purpose is the why. Why would you do all those things? Why would you try to shave extra minutes getting things done? This is actually where I needed help in. I went to a person I saw as productive and explained on his forum that I read about ten popular productivity books, and that I still wasn’t very productive. He told me that I have the basics down, and that the next step was having a reason compelling enough to use what I learned from them. He told me to read some biographies of productive people. This advice helped me a lot more than mentally beating myself up and telling myself “stop being lazy and get some work done”. My first reaction to this advice was “OK, he’s telling me to read more? I need to be doing something!”. It ended up really working out well for me though. Reading books on productive people like Steve Jobs helped me see how much focus these productive people put towards realizing their purpose. They had doubts and fears like everyone, but they just moved through them and took it one step at a time. It gave me perspective and a preview of what I’d be in for if I wanted similar results. Purpose and vision are similar but not the same. Purpose is the over-arching reason you’re doing something, but vision puts the senses in your purpose. Can you see it? Feel it? Hear it? Vision is the spark that gives purpose substance. Both purpose and vision can happen with just you and and piece of paper or computer, but commitment is where the rubber meets the road. I find that it’s what grounds these lofty visions and dreams and makes them practical and achievable. There will be obstacles if it’s a worthwhile vision, and commitment is what’s going to keep you moving through and around those obstacles. Steve Jobs was committed to his purpose of seeing a cell phone from his company and his visions of people using Macs and iPads and iPhones. Produce comes from the Latin word Producere which means to “lead” or “bring forth”. Commitment is whatever it’s going to take to “bring forth” your vision. Seeing your vision realized might require you to improve your skills in an area. Maybe you need other resources and mentors. Maybe you need to overcome negative and limiting beliefs that are stopping you from naturally being productive. The productivity techniques and strategies you read about all fall under the umbrella of commitment. If there’s no commitment, then vision has to sit on the sidelines as a wish. A compelling vision that ignites YOU is necessary in order for true commitment to happen….not one that inspires your parents, your boss, your partner, or society, but YOU. Productivity = Commitment to Purpose and Vision. That’s it. If you are committed to your purpose and vision of anything, you will be productive, and the extent of commitment to your purpose and vision will determine how productive you will be. Broderick Durisseau is a power blogger at Durisseau.com. Broderick blogs about productivity, facing fears, discipline, vision, beliefs, persistence and all things power.